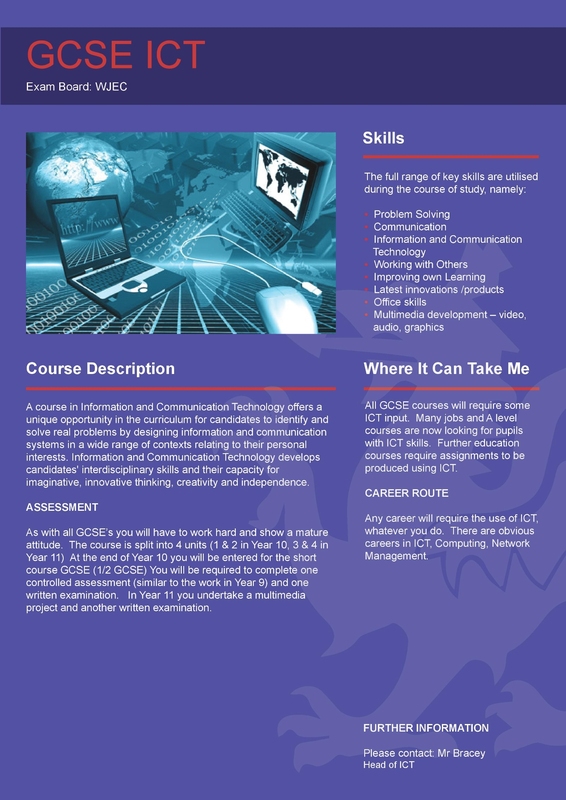 ICT/Computing is taught in mixed ability groups. The subject is very popular with students at all levels of ability and the department is in the process of overhauling the curriculum at Key Stage 3 in particular to keep pace with changing technology, legislation and best practice in the subject. All pupils have access to the full Office 365 suite, available to install on up to 5 devices, free of charge through our Office 365 portal. Office 365 allows secure email, calendar, 7GB of online storage on 'One Drive', Sharepoint VLE to share lesson content and resources all accessible anywhere with an internet connection. ICT rooms are staffed every lunchtime and at least 2 evenings after school to allow pupils to catch up on work missed, get extra help or generally relax. Students are taken on occasional trips to enhance the curriculum. With the move from ICT to Computing to Digital Literacy the department is actively investigating relevant trips for students at Key Stage 3 to enhance their understanding of the use of computing in businesses. During years 7, 8 and 9 pupils are introduced to programming both to create solutions, for example to create a game for a specified target audience. They will use industry standard software for example Microsoft Office 2013 and Adobe CS6. They will consider all aspects of e-safety. All pupils gain Level 1 Essential Skills Wales award during year 8.